Paper art print inspired by the Star Wars film A New Hope. Let the Wookiee win. Sounds like good advice! 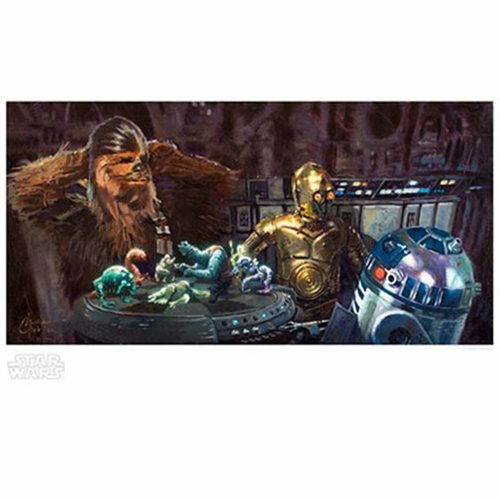 Inspired by the Star Wars film A New Hope, this highly entertaining Star Wars Let the Wookiee Win by Christopher Clark Paper Giclee Art Print shows Chewbacca, C-3PO, and R2-D2 playing the holographic chess-like game, Dejarik. An unframed limited edition of only 95 hand-numbered pieces, it measures 19-inches wide x 13-inches tall (image size 18-inches x 9-inches) and comes with a certificate of authenticity.